Jill Of All Trades: A visit to the new #StudioPepperfryVashi outlet! If you reside in Navi Mumbai, you will definitely visit Inorbit Mall in Vashi. And if you're around Inorbit Mall, you will not fail to see something new - a swanky new pepperfry studio that has just opened up on the occasion of Diwali! The sweet guys from Pepperfry called a few bloggers down to experience the studio and my were we impressed by how it looked! Every piece of furniture had it's own beauty, persona and charm - whether it was this rustic looking chest of drawers or a uni-cycle side-table that caught everyone's attention. This store, being the 22nd Pepperfry Studio is the largest in Mumbai (And Navi Mumbai) and 2nd largest only to one in NCR. At Studio Pepperfy, you can come experience the quality, finishing and mix and match furniture to make your own style! And once you have found what you love, you log on and add to cart, there is no sales or delivery happening from the store itself - quite a unique concept. Lovely map of all the Studio Pepperfry outlets around the country! Studio Pepperfry, 11,12 & 13 Ground floor. Pepperfry.com is India’s largest furniture and home products marketplace, that operates in categories across furniture, décor, bed & bath, furnishings, lamps, kitchen, dining, bar, housekeeping, hardware & electricals, garden and kids. 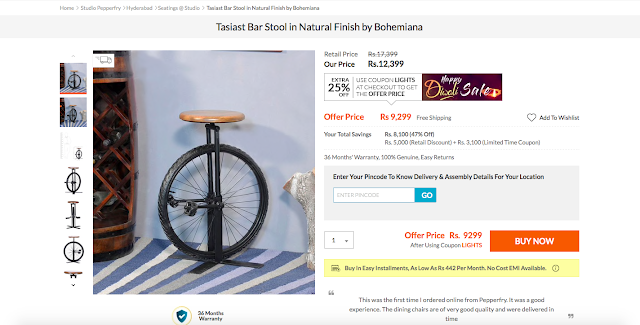 “Studio Pepperfry” is a one of its kind concept store from Pepperfry.com, India’s leading online Furniture and Home marketplace. 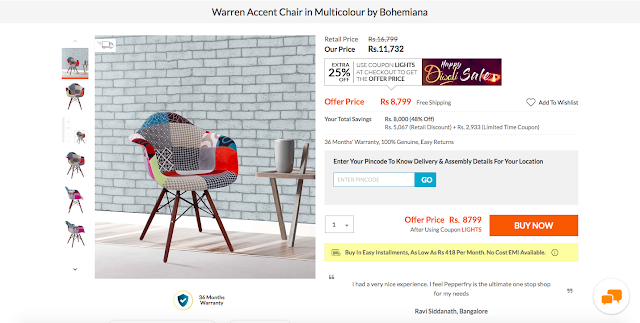 It showcases a curated range of furniture from the online portfolio of Pepperfry and serves as a design inspiration. At the Studio one can experience the cutting edge design, various types of furniture with different wood finishes and get an idea of the overall quality of the furniture from Pepperfry. Here interior design consultants assist in browsing through the entire Pepperfry furniture range. These experts additionally offer free in-store design consultancy on furniture products ensemble to furnish homes that that are aspirational while reflecting the latest and best in contemporary home design. A unique concept from Pepperfry it demystifies the furniture buying process and makes it a delightful experience.